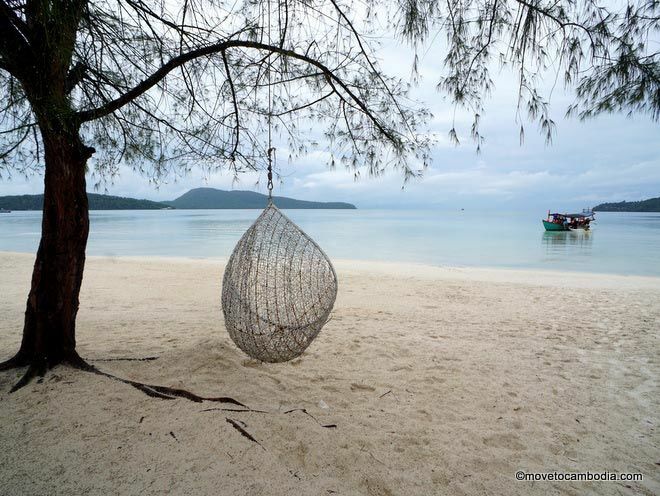 The seafront igloo-like domes at Moonlight Resort are one of the few truly high-end offerings on Koh Rong Sanloem. When the old Cambodia hands who have been bumming around the islands for years say, with a mixture of horror and disgust, that they heard there are now high-end hotels with air conditioning that cost more than $100 per night, Moonlight Resort is what they’re talking about. 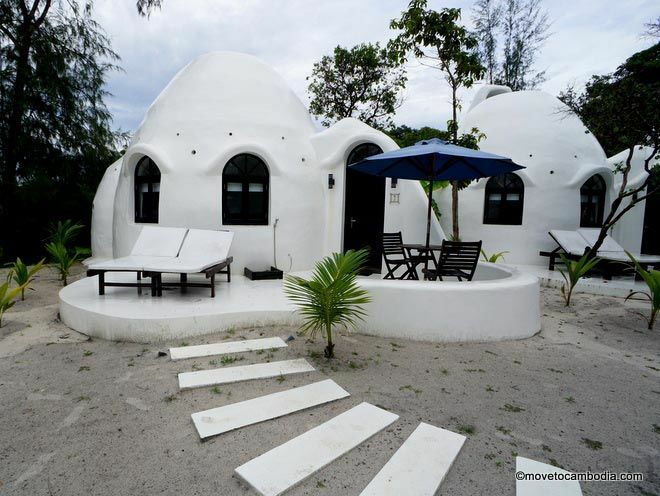 The domes at Moonlight Resort are about as far from the average beach bungalow as you can get. The Moonlight domes are just steps from the sea. The luxury domes — round, white stand-alone rooms — more closely resemble snow-covered igloos than bungalows. 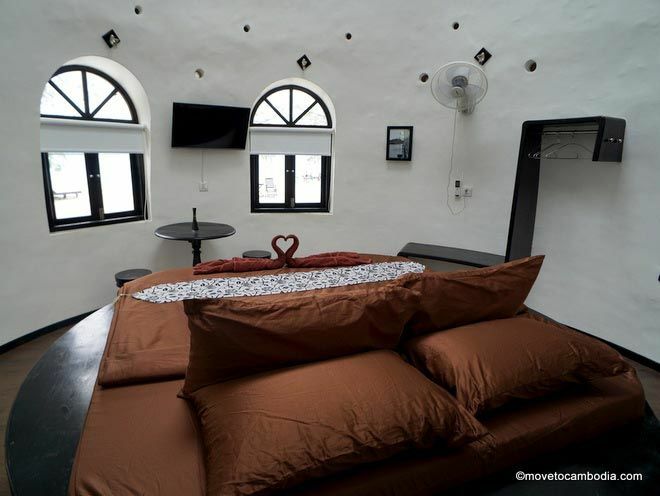 Inside they are fully equipped to a high standard, with a round bed in the center of the room. Above the bed is a round skylight through which you can watch the stars. There’s also a window nook facing the sea that’s big enough for lounging, or used for a small bed for a child. Is it bungalow? Is it a dome? Is it an igloo? The place has 24-hour electricity and WiFi, and all of the domes are air conditioned. The domes also come equipped with cable TV, a refrigerator with mini bar, electronic safe, electric bug zapper, and fans, and the blue-tiled bathrooms have both cold and hot water. Each has a private patio with two sun loungers and a table and chairs with sun umbrella. Inside one of Moonlight’s round villa-domes. 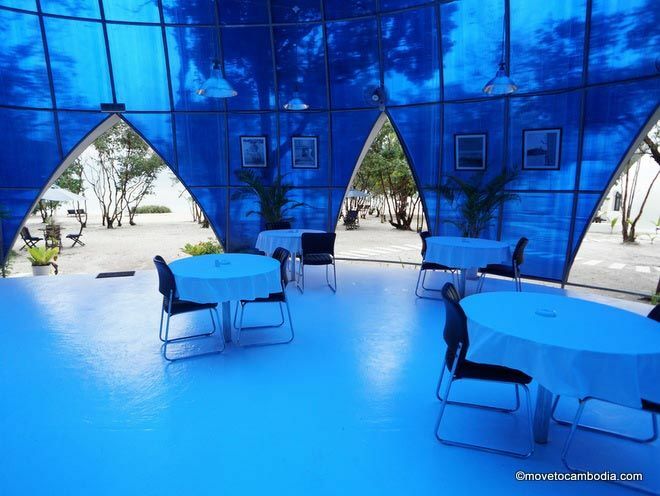 In the middle of the beachside property is a large blue dome, an alien mothership that got off course and accidentally landed in Saracen Bay. But wait, no, it’s the Blue Moon Restaurant. Bathed in blue light, the restaurant claims to be the best on Koh Rong Sanloem, but our experience there was decidedly terrible. Our meal took more than an hour to arrive, and when it did the staff had gotten one of our orders wrong, and the hamburger that we had ordered was still frozen in the middle. Yet, we continue to hear good things about it, so we assume the usual kitchen staff and waiters were napping when we visited and their evil twins had taken over for the afternoon. With its white igloos and giant crystalline blue dome restaurant, Moonlight Resort seems oddly out of place on a tropical beach. But it is objectively one of the few true luxury accommodations on the island. The walk-in prices we were quoted are the same as what is available on online, although for last-minute bookings they often knock 20% off if you make the reservation on Booking.com, and prices on Agoda are lower still.